Jewelry Cleaner and Polish Re-launch Coming Soon! Everyone Has a Jewelry Cleaner. This Is a Polish. See the Difference! Purple Miracle jewelry cleaner and polish also works on stones, metals, chrome, glass, mirrors, plastics & more. Perfect for antique, fine and costume jewelry, eyewear, watches, electronic screens, mirrors, boats, autos, cycles, and fans. Created right here in the United States in 1994, Purple Miracle is the jewelry cleaner and polisher customers turn to first. Our cleaner & polisher uses no acids, ammonia or abrasive agents to clean your jewelry. 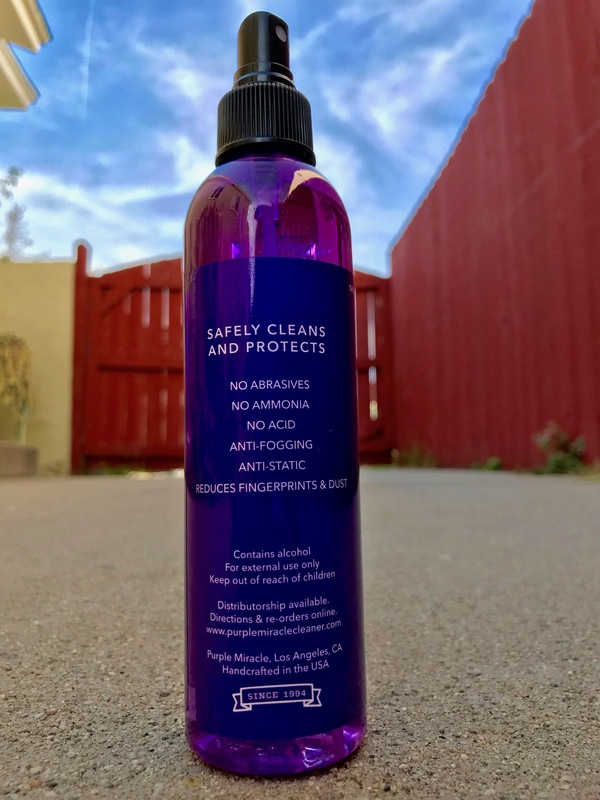 Purple Miracle is also an antibacterial and environmentally safe! Purple Miracle Polishes As It Cleans! Not only can our cleaner polish your jewelry to a brilliant shine, but it’s also great for stones, metals, chrome, glass, mirrors, plastics & more. autos, cycles, & fans. Remember that includes bathroom mirrors, windshields, rear view mirrors, winches, and hubcaps. You can feel safe cleaning things. Purple Miracle has no abrasives, no ammonia, no acids. 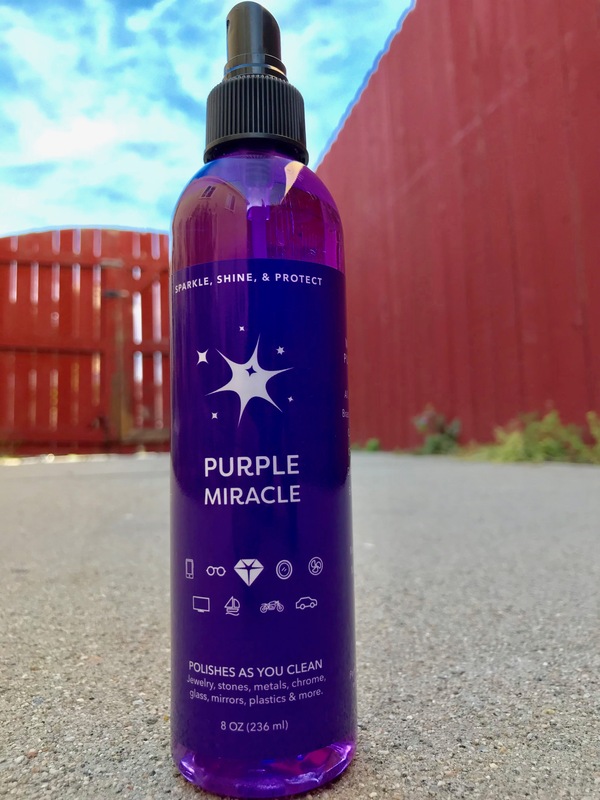 Purple Miracle is an anti-fog, anti-static agent that prevents fingerprints and dust. 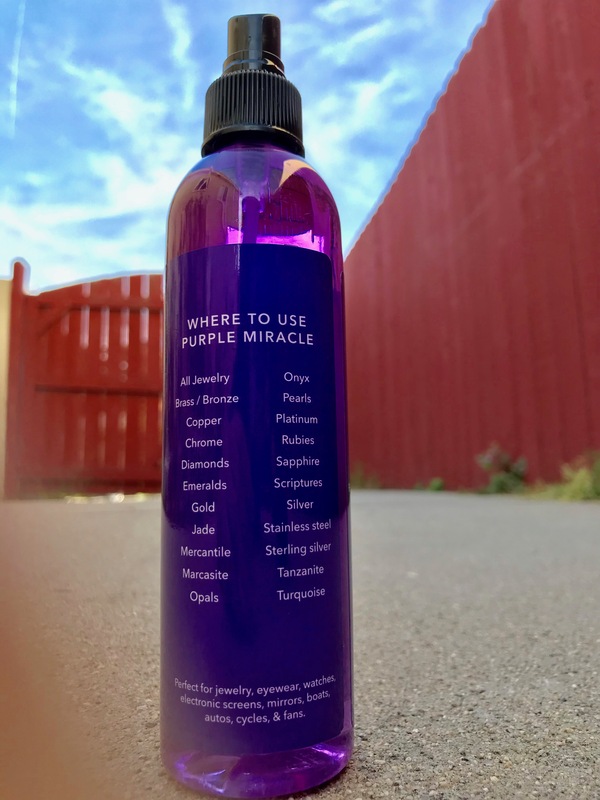 Do you want to know where you can buy Purple Miracle? Email us and we’ll send you an invite to events you can attend to buy “the Miracle” and more. Purple Miracle offers a full refund if you are not happy with our product. Simply contact us and send back your bottle for a full refund. We ship via USPS. It is the cheapest option to ship liquids as they are very costly. You will be provided a tracking number with every order. Unfortunately, because of the cost to ship, we do not ship outside of the United States. Please email liam.b@brandawakening.com and provide your order request and contact information and we will contact you ASAP to arrange the order. We will have this product available to order online in the future. For now, we will handle orders manually. Use a microfiber cloth or paper towel (as needed). Always check the manufacturer for cleaning instructions. Generously spray jewelry. Spray soak brush head. Brush jewelry. Rinse and buff dry. For Pearls and Opals refrain from using a brush. Spray cloth and wipe and/or spray surface sparingly (to avoid streaks) and buff with cloth (cotton or microfiber work well) until dry. If streaking occurs flick water on screen or cloth and then use cloth on the surface to bring away streaks. Clean blades as you normally do, the spray a light mist of Purple Miracle across the blade and let it dry. You’ll be dust free for months.